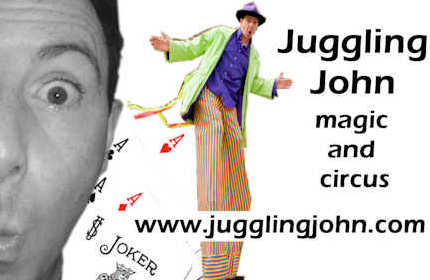 Juggling John provides entertainment for a huge range of events and for all age groups. 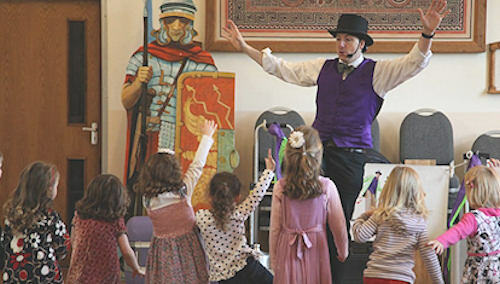 He is a specialist in childrens parties. Because he is aware that different things appeal to different age groups he has adapted his party packages accordingly. 5, 6 and 7 year olds love parties! They generally have a more developed social life than their parents and it is not unusual for them to have at least 2 parties to go to in one weekend. By this stage they have become used to the party concept and are quite happy to be left at the party while the parents sneak away for a couple of hour's shopping/relaxing. 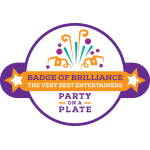 They love live, interactive entertainment with a touch of wonder and magic mixed with loads of fun and energy. As a father of 3 boys, Juggling John is very used to this! 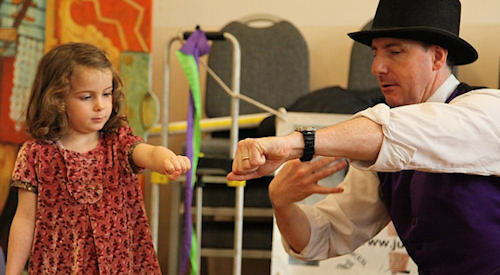 A. a 45 minute show including juggling, magic, balancing, physical comedy and puppetry. 4. "ABCtea" - dancing and workshop, break for tea, then show (with or without fire) - John will be with you for 2 hours but with a break at tea time. Obviously, option 1 is the cheapest package and 4 is the most expensive. Prices vary with date and location. Please click here to get an instant quote for your particular situation.